Create a truly personal gift using your own child's photo. Perfect as a gift bar for a special relative, birthday gift bar for the child themselves, bridesmaid/pageboy gifts, or even on chocolates for their party bags. 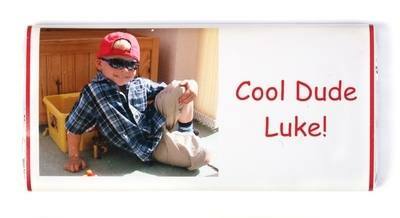 Just send us your child's photo (either by post or e-mail) and we will put it on the chocolate bar wrapper for a truly personal one of a kind gift. A message can also be added to the front and back of the wrapper to make it even more special. Matching products also available using your child's photo, ie: love hearts, party poppers and smaller bars.